As a scratchbuilder how many times have I looked through the vast listings of that institute known as eBay. Just hoping to catch a special static model in 1/32 scale, just so’s I can shove a motor in it and stick it on the shelf. Well, the total time could be measured in weeks, but the end results are most rewarding and a treasure to me. 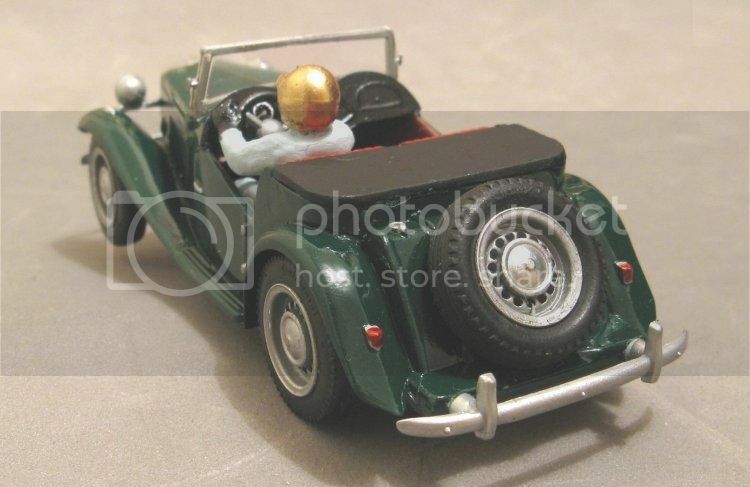 Probably my favourite model to date is the Mk1 Austin Healy (Frogeye) Sprite. A great little shape and a great little model. There are models I have bought long ago and still haven’t broken the cellophane! Maybe during the years of my dotage I might get round to them. Maybe they may end up back on eBay! But the message is that no matter how hard and far you look, what you are really looking for is probably just around the corner, and a local one at that. And the subject matter of this little story is ever so much one of those models. 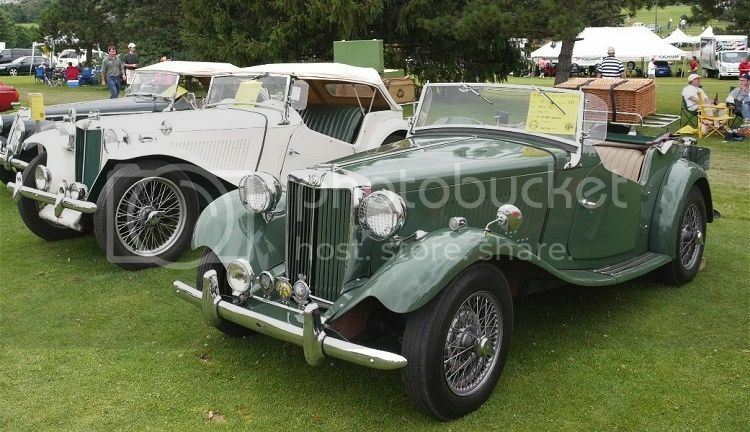 The first series of MG cars were actually built from rebodied Morris cars; MG standing for ‘Morris Garages’ which was a UK car retailer in the years before the Second world war. Their situation was similar to all those guys that were building one-off specials from Austin Sevens and the like and racing them around muddy paddocks just for the hell of it. How many pictures do we see in classic racer books and in biographies of our favourite racing drivers of all time, the youthful mud spattered face of our boyhood hero either besides, behind or in the seat of one of these little specials! MG cashed in on this and pre war we see them go one step further and supply sports cars to the general public for road or track use. 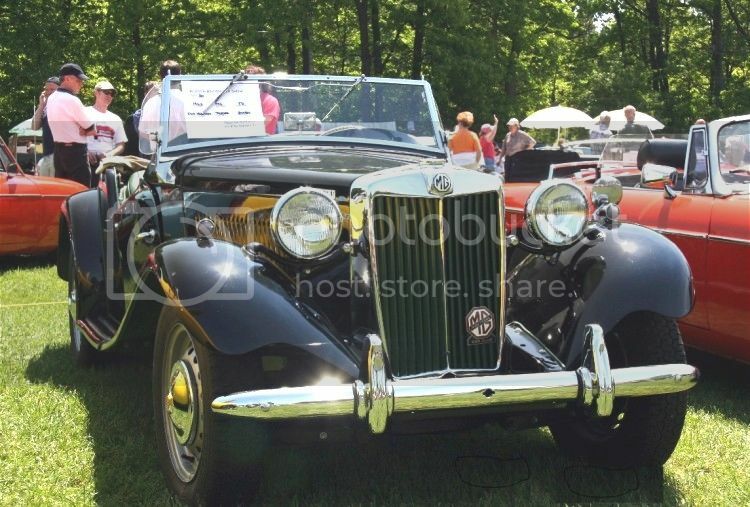 MG was busy with the war effort and cars didn’t feature in their production plans until the war was over. This time they were ready and the new models were soon exported world wide and it seemed they were here to stay. In my view, one of the most iconic MG’s is the TC, made in 1948 and replaced by the TD in 1953. and , as it happens, the TD is where we start this story. I was in conversation with fellow scratch builder and friend Terry at a meeting one time, when he happened to mention that he was sorting through a load of personal effects stored at his home with a view to getting rid of a lot of stuff, when he came across some old modelling stuff. 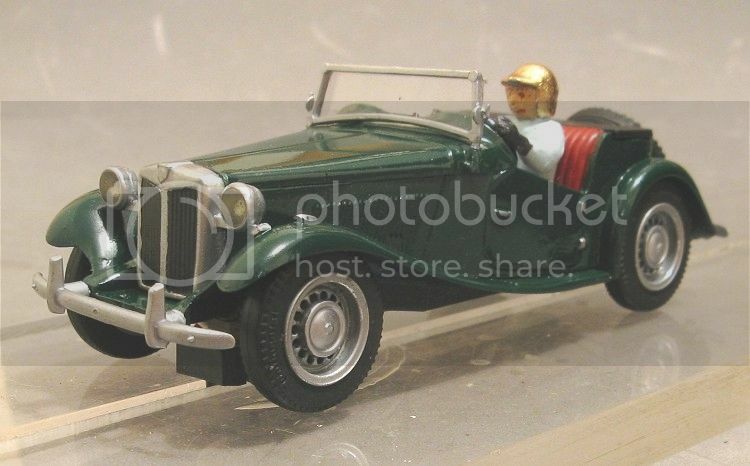 Amongst this ‘stuff’ were two, yes two….MG TD 1/32 kits. They were in plain clear bags and there was no manufacturer details anywhere to be seen, so who made them is anybody’s guess. One thing for sure was that I don’t remember ever seeing them on eBay or any other place for that matter. The models are made of a softer polystyrene and are fairly basic, although they do retain good detail. I am assuming they are possibly of US origin as they are left hand drive. I suspect they are from the late fifties or early sixties as the parts have that ‘60’s fit to them. Joints and parts needing a degree of fettling for them to fit respectably. But apart from that the models are a couple of little gems! And as mentioned above, possibly rank as one of my most sought after models. So what was the deal, well the deal was, if I built Terry a working chassis for one model he would let me have the spare! Well, how Terry never lost a hand when he said this, I’m not sure, but the models were on their way back to sunny Wellington Point and plans started in earnest. It was accepted that they would have one of the wixwacing patent PCB chassis and power was to be from one of the little HO cube motors we had bought. Drive to the rear axle was going to be by propshaft and as much of the interior detail would be retained as possible. 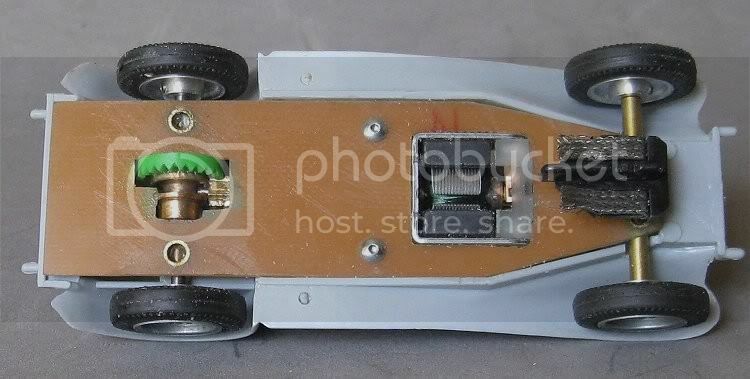 The chassis was cut to fit inside the underbody of the kit and then the axle layout was established. Once settled on, I could then determine where the motor was going to fit. Another tricky bit was the propshaft. The motor has a 1.5 m.m. output shaft and the pinion shaft is 2.0 m.m.?? A solution was at hand though. Terry called in a favour of one of his local modelling friends who has a modellers lathe and had some joining pieces made up. A short piece of brass tube counter bored 1.5 at one end and 2.0 at the other! This was a press fit on the motor and a drop of solder fitted it to the tail shaft. The tail shaft also had a sleeve over it which would act as a rear mount when the motor assembly was fitted in place. The rear axle was an issue too because although the model comes with a soft top alternative, I wanted to present mine with the hood down. 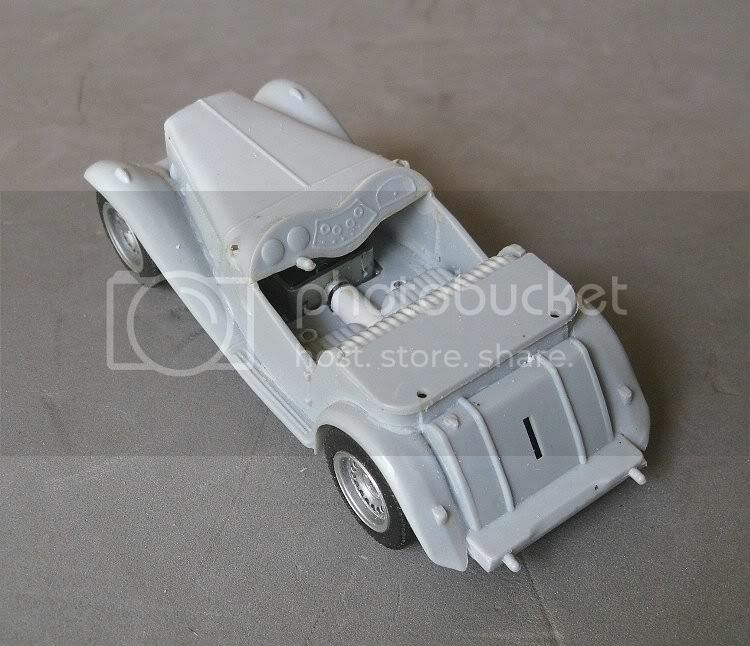 The seats and tonneau come as a one piece moulding and at some stage I was going to have to get a driver to fit. 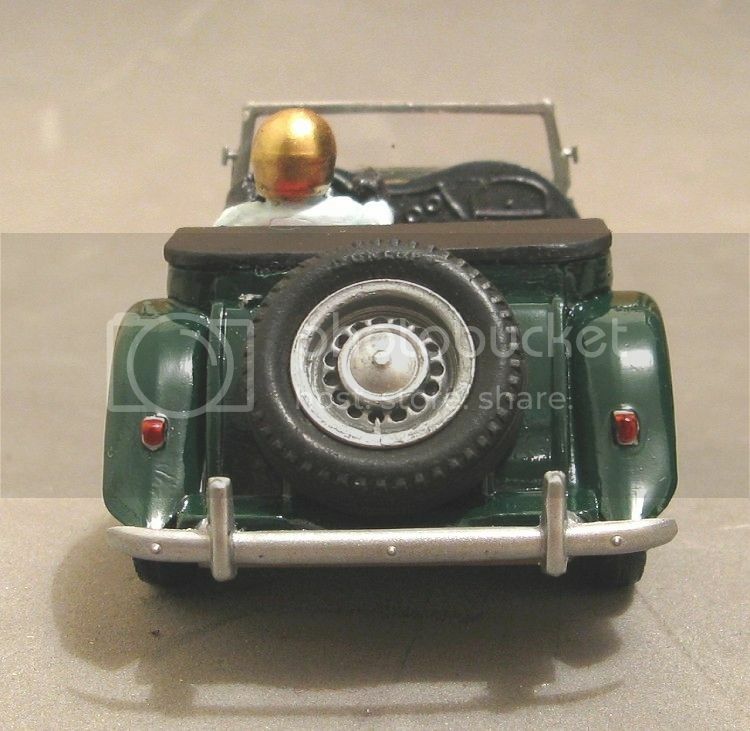 Not building this model to a particular era, I decide to use a full length Fly driver with open face helmet. Once the motor position had been determined I then checked the available space for the driver. The first obvious modification involved the driver sitting too close to the steering wheel. To get him to fit would need some attention to things like arms!! Eventually I drilled him from shoulder to shoulder with a 1/16 drill. The arms were then cut through at the shoulders with a razor saw. A piece of 1/16th brass tube was inserted in the drilled hole in the body and the arms slid over the tube. Offering the driver up to the driver position, I then determined that the arms needed modification at the elbow region! So, the arms were cut three quarters through on the upper side at the elbows. The arms were then carefully bent upwards to reduce the drivers reach. Once the best arm length was reached I superglued them I place. The arm joints were then filled with more superglue to ensure they wouldn’t come unstuck at a later date! During the general conversion the driver was primed and painted and prepared for fitting when the time eventually arrived. Once the motor and axles were fitted in place, the guide was squeezed between the motor and the front axle. Not being a racer, I didn’t want it to be proud of, or noticeable from the front. The body was assembled and prepared for painting in my usual way. 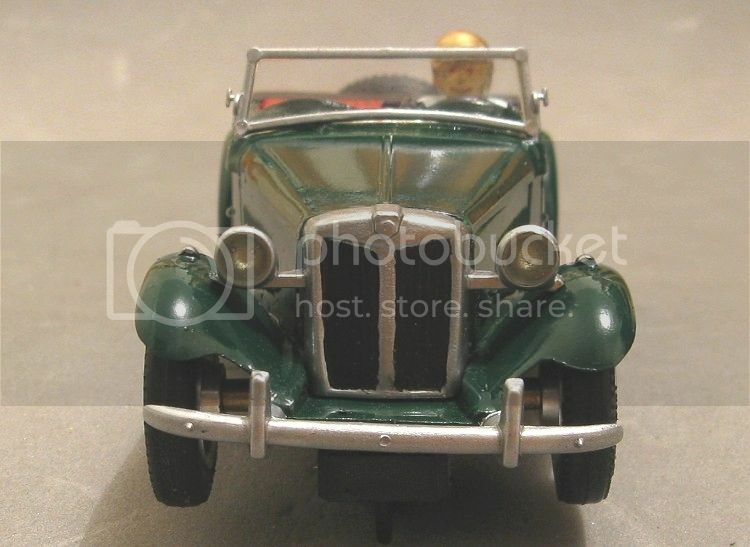 The parts to be silvered were left off and were given their own treatment of ‘Bright Chrome’ enamel from the auto store. Once well dried, the silver had a couple of coats of clear acrylic. The windscreen was painted on its front facing surfaces and once dried was placed over a piece of clear sheet that had a strip of masking tape on it. The screen frame was drawn round and the screen profile was cut and sanded to a better fit. A film of clear epoxy was brushed onto the back of the frame and the frame was placed on top of the clear screen. Once I was sure it was in the right position I laid some square alloy tubing on top of it purely to hold it in place while the epoxy was curing. So moving on, there were the wheels to be sourced and sorted. But where was I going to get some narrow wheels in these days of mega wheels? The inserts needed to represent pressed steel wheels too. Mmmmmmm? After a bit of measuring I decide on some narrow wheels from the now defunct BWA. They also supplied the wheel inserts, these were the classic BMW inserts. The kit came with some very basic wheels but they did have fair hub caps, and these were modified to fit in the dish of the wheel inserts. The wheel inserts were installed and painted with some silver enamel. This had a greying effect which is about right for these early steel wheels. The silver was then given a coat of clear acrylic. The hub caps were trimmed and placed on a painting stick and sprayed with ‘Chrome silver/ again from the auto store. This makes the caps look a lot brighter then the brush painted wheels. Once all was dry, the caps were epoxied in place and eventually everything got a couple of coats of clear acrylic! So what was the tyre solution? Not easy! Looking through my extensive spares boxes I came across some Airfix tyres. 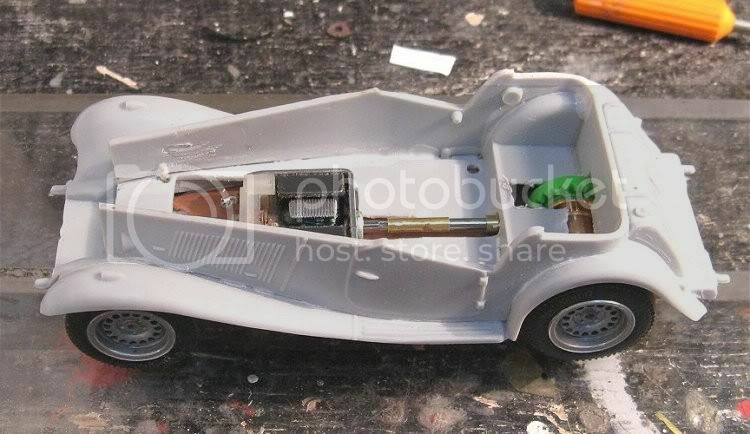 These were for the front of their early Auto union and Mercedes models and fitted the rims a treat. The tyres even have the ‘Continental’ logo quite clearly on the sides. 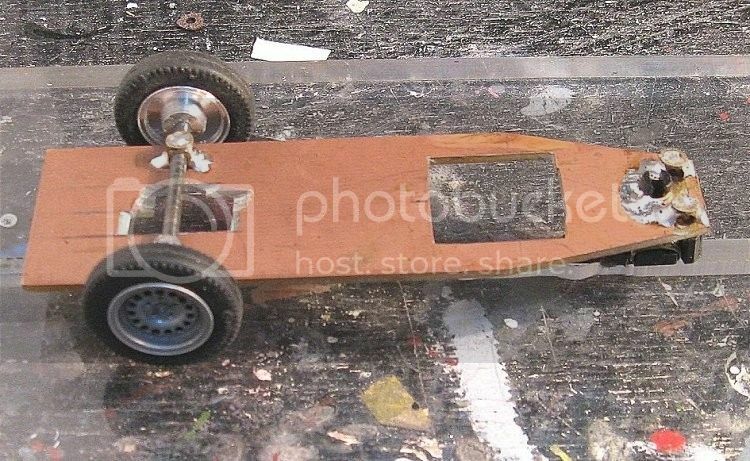 The model had a few practice laps at the Red teams home track before it was painted, just to iron out any faults. As it turned out, there was very little to be done, and a couple of minor axle adjustments saw the model running beautifully. 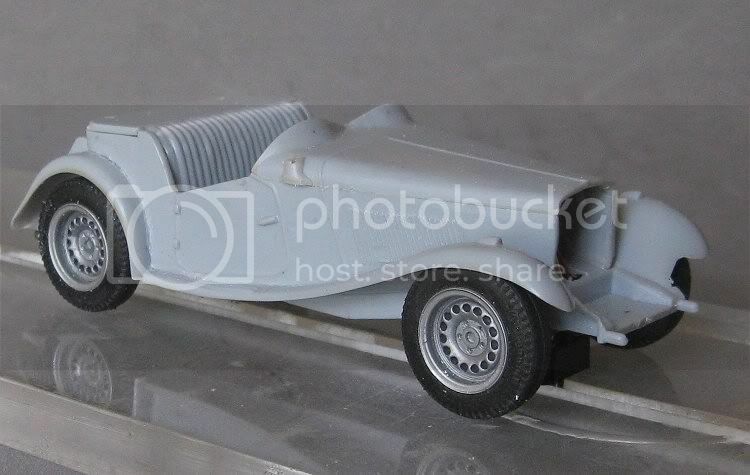 At the time of writing I do have some urethane tyres being moulded, in the pipeline, but until such time as they turn up the model will run very nicely on the Airfix rubber. So with the chassis working well it was time to finish the body. What was it to be? Green, Blue, Cream, Red? So many choices, but in the end I decided to livery it in BRG and after some picture searching on the net I settled on a basic road going livery. The black bits on the radiator were painted before fitting and other small parts like lights, door handles etc were painted on and clear coated. The hardest bit was fitting the driver. He already had a 1/16 pin sticking out of his bottom which lined up with a corresponding hole in the drivers seat. The necessity for this was because the steering wheel had to be slid in at the same time as the driver, and the driver needed to be fixed before the glue dried to stop the steering wheel sliding back out of position!! Anyway, it all worked and the driver and the wheel are now fixed in place. Last items to be fitted were the front and rear bumpers and the screen. This was all pretty straight forward though and the only hiccup was that the bottom of the screen frame was a different contour than the bonnet. No matter, it’s on now and you don’t notice it if you are not looking for it! The screen was stuck with clear epoxy, this was to impart a degree of strength to the screen incase there was an unpredictable deslot. Hopefully the screen will be tough enough to remain in place. Once again I reckon I have finished up with a great little model and I’m sure there will be several local racers who will lust after it once they see it! Once it has done the rounds I’m sure it will be happy in the cabinet, and happy to be taken out and run on special occasions!! Local guy Jordan (Kenneth) kindly made me a pair of urethane tyres for the rear, moulded from the originals. The model is an absolute pleasure to drive..... not at breakneck speed, but with the voltage turned down to eight or nine volts. 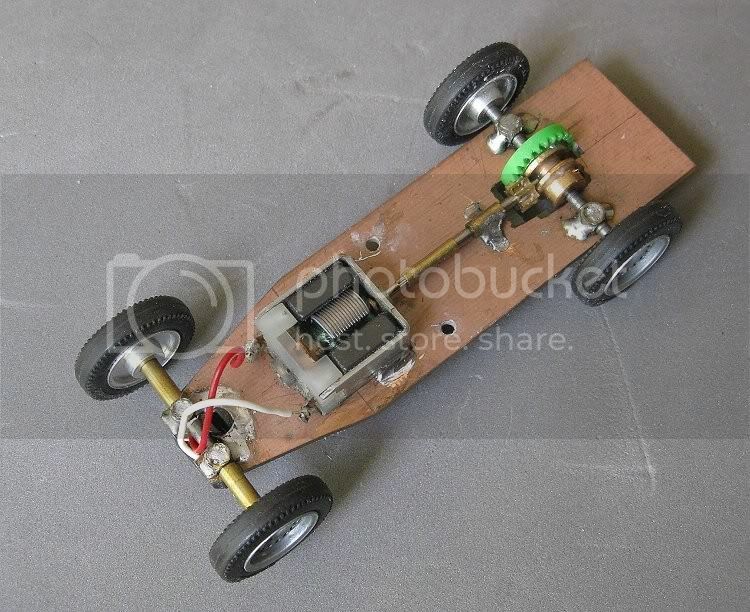 It is generally not understood that nearly all the little HO motors are rated at 28,000 rpm, from Ninco Karts to Scaley trucks and even the dreaded Scaley Fiestas!!! So some sort of speed attenuation is required. The result....I could drive it for hours on its own!. It looks especially fabulous on a landscaped track like the Red Team's and you can almost sense the wind in your hair!!??. Maybe I'll make a long silk scarf for the driver??? Mmmmmmm? 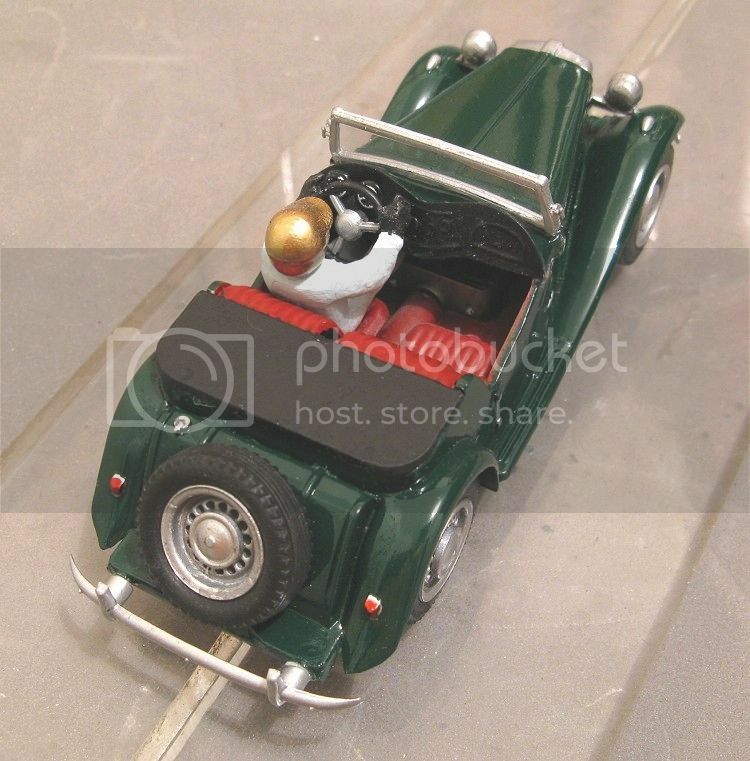 Now where's that Matchbox '48 Jaguar 'SS' ? ? ? ?